Optimal fetal positioning during labor -- where your baby is head down and facing your back -- positively influences your labor. Babies in this ideal position have an easier time moving through your pelvis and down the birth canal. Since fetal positioning is so important, you may wonder if an activity such as climbing stairs can negatively impact your baby's position. However, no matter what your baby's position, normal activity should have little to no effect on it. Throughout most of your pregnancy, your baby is a whirlwind of activity. By the end of the first trimester, he can move his head, bend his legs and raise his hands to his mouth. During the second trimester, he can kick, twist, jump and grasp with his hands. The effect of all this movement is that your baby's position constantly changes. However, by the third trimester, your baby starts to run out of room to move, since during this last trimester his weight triples and his length doubles. Because he has less room to move around, he tends to find one position and stay in it. By 36 weeks, most babies have moved into the head-down position in preparation for birth. Changing your baby's position is a difficult and uncertain process, even for medical professionals. Your doctor may attempt to turn a baby into a head-down position by performing an external cephalic version. With this procedure, the doctor manipulates your stomach in an attempt to manually turn your baby. It has a 90 percent effectiveness rate for turning a baby who is lying sideways but only a 58 percent effectiveness rate for turning a breech baby. Even if it works to turn a baby into a head-down position, babies often flip back to breech later on. A few at-home methods exist for attempting to change a baby's position, but they typically require repeated attempts and a significant investment of time -- much more than is involved in climbing a flight of stairs. BabyCenter.com suggests trying to change your baby's position by doing pelvic tilts, where you elevate your pelvis 9 to 12 inches and then rest your hips on a pillow. Another position you can try requires you to get on all fours, resting your weight on your forearms and sticking your bottom up in the air. Both positions should be held for five to 15 minutes at a time and practiced twice a day, starting at 32 weeks. Whether they have any effect on a baby's position remains unproven. So far, no scientific evidence exists supporting the idea that a pregnant woman's position affects her baby's position, according to BabyCenter.com. Thus, you can safely climb a flight of stairs without worrying that it will affect your baby negatively. 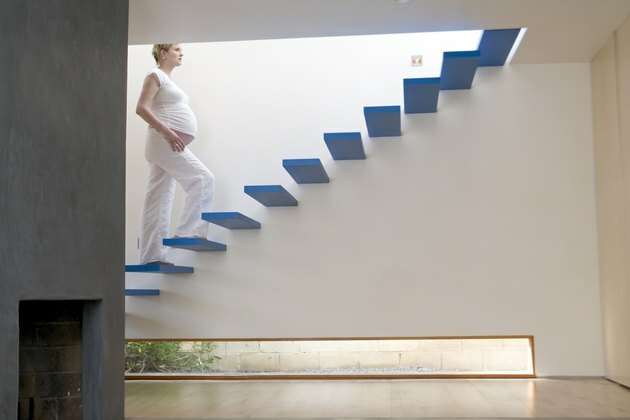 In fact, climbing stairs can prove beneficial while you are in labor. Lamaze International includes stair climbing as a helpful movement women can use during labor to help their labor progress. University of Minnesota: What Factors Influence the Progression of Childbirth?